Stephen Perse Junior School pupils enjoyed trips to different Cambridge colleges in their house groupings as part of the 'It's Our World' project. 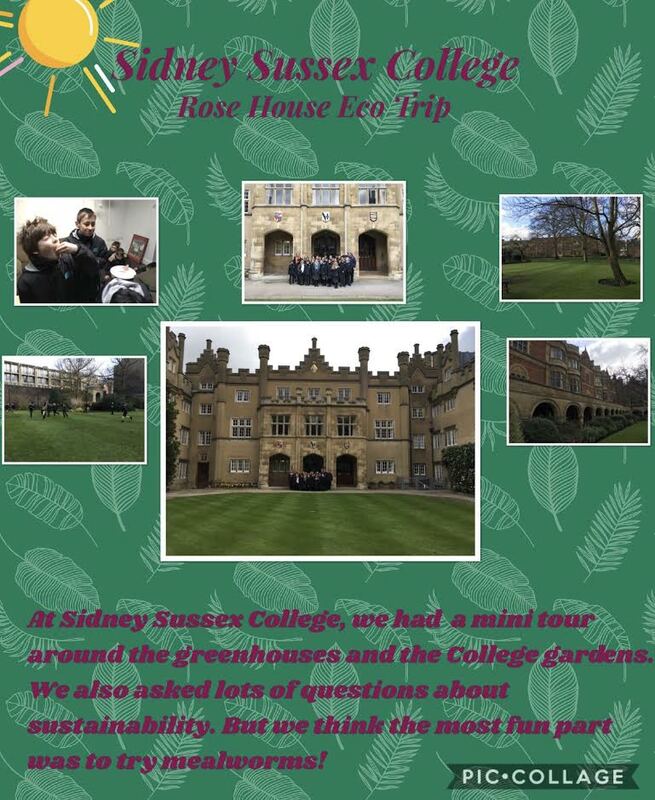 Pupils from the Stephen Perse Junior School enjoyed visits to various Cambridge colleges to learn more about what initiatives they use to be more sustainable and reduce their environmental impact. Here each house tells us about their visit. What a morning Cattley members had! They were pushed along by the wind towards Clare College with a walk through our beautiful city. Meeting Jo, who works at the College and is in charge of their Green initiatives, by the old gate and being led into the Fellows’ Garden was magical and Cattley members could be forgiven for thinking they were in a rural part of the UK, rather than in a city. This group proved to be fantastic at listening attentively and asking insightful questions. Some highlights of this visit were that Clare College held a competition to see which set of students turned off the most lights (their cleaners were the spies!) and the winners were awarded a prize. They have found that the energy consumption has gone back up after the competition so it was clearly a good incentive! One of the questions from our pupils highlighted their love of animals as they asked about whether the College has any specific habitats to attract nature. We were delighted to see both bat and bird boxes in the forest area and Kate, the College gardener, welcomed the idea of receiving some homemade Bug Hotels from Year 4 in the summer term. After noticing a person in a high-vis jacket on the roof of one of the older buildings, Jo explained that they are using local slate for essential repair work. One of our keen pupils asked what they intended to do with the slates being removed. These will be resized and sent for use on a smaller building. Cattley members then handed Jo some of their own posters for display in the College to encourage the students to be more eco-aware. All in all, it was a fabulous morning with some very switched on pupils who are clearly passionate about our environment. 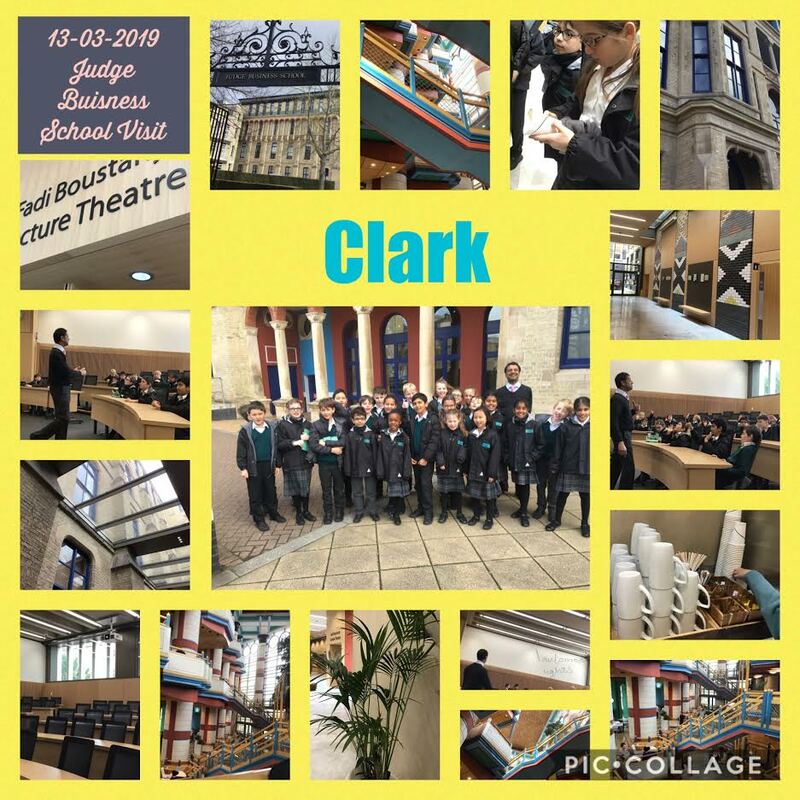 On Wednesday 13 March, as part of the Junior School’s Integrated Learning Project, Clark members walked to the Judge Business School. Before leaving school we did some research and discovered that it was the original Addenbrooke's Hospital! When we arrived, we were met by Radha’s father, Dr Sangray, who gave us a fascinating tour of this very eco-friendly building. We were really impressed to learn how sustainable the place is and we were amazed by the architecture of this modern building. At the start of the tour, Dr Sangray showed us two plants pots and asked us whether we could see a difference between them. We discovered that the plants have a clever watering system that is on a timer and saves water. Next, we were taken to one of the many lecture rooms where we had a very interesting discussion and got all of our questions answered. We were split into four groups and took it in turns to ask Dr Sangray what we wanted to know. We learnt that they don’t have any air conditioning or radiators in the new building at JBS, instead they only have very economical, low energy underfloor heating. Also, in every room there are automatic lights which turn off if no one is in the room - this saves a lot of energy. After we had our questions answered, we were shown the recycling units and then allowed to climb up to a higher level so that we could really get a feel for the awe-inspiring entrance hall at JBS - from there we could see almost everything that was going on! We are all very grateful to Dr Sangray for giving up his time to show us JBS and give us such an interesting, exciting experience that has shown us how environmentally friendly a building can be. We are sure that no one will forget it. Have you had to upgrade your heating? There are no radiators or air conditioning in the new part of JBS. The only heating JBS has is low level underfloor heating which is very economical to run. Do you encourage your students to take part in switch off fortnight? There is no need for this as the lights and computers automatically turn off when not in use. Do you still use plastic cups? The reusable cups are all 100% compostable and are lined with plant extract not oil. Have you tried to cut back on paper? Yes! Students hand in their assignments as attachments to emails. Do you ever have meat free days in the dining room? Do 75% of your staff / pupils come to school by bicycle / do people drive in? Everyone is encouraged to do so and Clark pupils saw lots of evidence of people cycling! What is the main focus of your challenge to be green? To reduce the use of electricity. How do you look after your plants? The plants have timed watering devices for the plants so they are not over watered or under watered. We loved getting into groups and asking our questions. Dr Sangray’s answers were really informative and he made sure we all got an opportunity to talk. We were so interested to hear that the entrance hall was designed to look like a forest of trees, with pillars as tree trunks and the amazing roof as the sky - it was fantastic to see it! We were very surprised that the cups were made from plants. We were intrigued to find out that the JBS is so high tech and yet so very sustainable. It was surprising that there were no radiators, only under floor heating, but it was lovely and warm! We liked that they have chips in their computers that turn them off after half an hour of inactivity. It was wonderful to see how thoughtful the JBS is: they really have considered how to be green. Our walk to Pembroke College took us past the Judge Business School, the Fitzwilliam Museum, Peterhouse College and Emmanuel Church, all of which seem impressive buildings to passers by. Our destination, however, is rather hidden away and it was not until we had stepped into the College that we realised what a beautiful and peaceful place lies right next to a busy stretch of Trumpington Street. We were warmly welcomed by Andrew, Pembroke’s Finance Manager, and Robert, the Buildings Manager. They led us into the first courtyard of the third oldest College in Cambridge. Thanking us for the questions which we had sent in advance, Robert said that he was going to answer some of these by taking us on a tour. We began by climbing a narrow spiral staircase, unofficially known as the Harry Potter stairs! During our tour we discovered that Robert and his team have replaced thousands of traditional light fittings with motion sensor lights; it was fun in the corridors when he asked someone to walk until the light came on and we counted how many steps it took. We then met two of the College bed-makers (they don’t actually make any beds but that is their job title) and learnt that they use far fewer cleaning products than before and they buy eco-friendly varieties nowadays. Our next stop was the College Hall, which is really grand and very like the Hall in the Harry Potter films! Andrew and Robert took turns to read out our questions and answer them. It was fascinating to discover that the College installed new gas boilers about three years ago. This cost a huge amount but Robert said it will be worth it in the long run as these are more economical than the old boilers and they don’t need to use electric heaters for colder rooms now. Robert used to worry about the old boilers breaking down and everybody grumbling it was cold but now he can sit at his desk and see how much heat is being used in every room! We learnt about the pipes being insulated and how the heating drops down to 5 degrees when a room is empty. They also have energy efficient white goods, like fridges, and Robert suggested we check the energy rating of appliances in our own homes - a great top tip. There are around 700 students living in Pembroke so they cook a lot of meals every day! Everyone has different preferences but the catering team do their best to serve alternatives to meat and they have ‘meat free Mondays’ just like we do at SPF. We asked about solar panels and discovered that Pembroke does have some but they are quite hidden away because people don’t really like seeing them on beautiful old buildings. We learnt that they recycle all the cardboard delivery boxes which come into the College, we heard about a new development which will be energy efficient and we talked about how the students are very keen to share their ideas for making the College as eco-friendly as possible but usually it is up to the staff to find ways of putting these into action. After the talk, Andrew and Robert suggested we top up our energy levels(!) with refreshments - these were truly delicious and as we enjoyed them there was time to ask more individual questions and take in the glory of our surroundings. Before leaving the Hall we were amazed and delighted when Andrew and Robert presented us with gifts of low energy light bulbs, night lights, pens, keyrings and notepads; this was so generous and much appreciated. 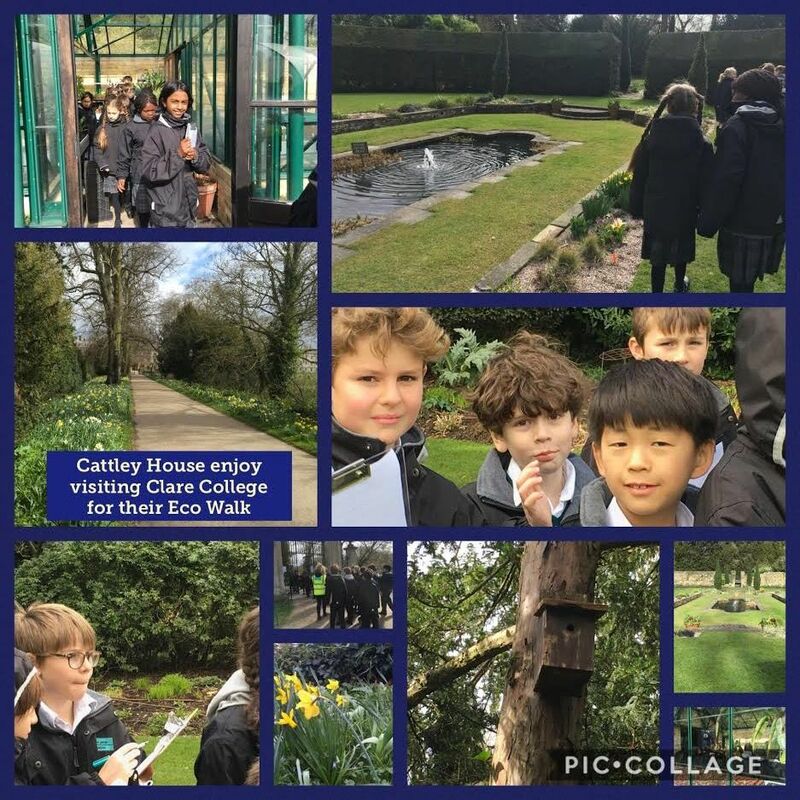 Our final ten minutes were spent out of doors where we admired the gardens, looking very spring like, and saw the outside of the building which has the solar panels. We were then led to a little gate which took us out on to Tennis Court Road. 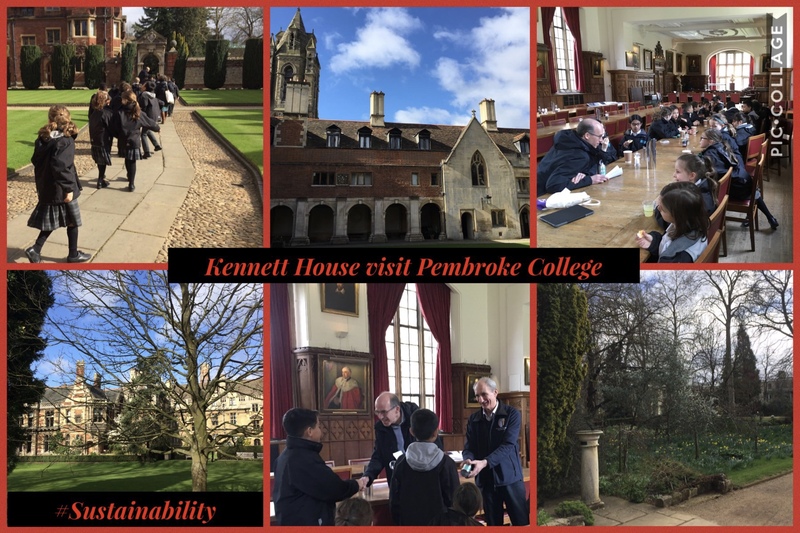 What an amazing experience this was - not only did we feel reassured that Pembroke students and staff certainly care about their impact on the environment but we also felt very fortunate to visit such a special place in the heart of Cambridge. Thank you very much indeed to both Andrew and Robert for such a wonderful visit to Pembroke College. As part of our sustainability week, Pollock had the delight of visiting Gonville and Caius College, the home of Stephen Perse. Before setting out for the rather windy walk, we gathered in class and spent time reflecting on our questions and thinking about how sustainability may be addressed at our chosen college. Every Pollock member created a question of personal interest and wrote it down on a piece of card that would return with us providing more information about our enquiry. Then joining our fellow Houses we dotted off in to Cambridge to find out more about these important issues and seek answers to our burning questions. How could we make a difference too? On our walk we looked at all the ways in which Cambridge is being sustainable and also how perhaps we can improve on this. We were shocked to see how much litter had made its way into the streams and streets. When we arrived at the College’s Great Gate excitement mounted. We stood in anticipation for Jane and admired the beautiful grand building. Jane then arrived and took us to Jennifer who was preparing for our visit and eager to receive our questions. After being lead through the immaculate gardens and wooden staircase we entered the big dining hall. Wow what a sight, high old wooden ceilings and we were surrounded by paintings of important figures of the College, as well as by few beams of sunlight through stunning stained glass windows. Jennifer and a college student who she works with in addressing eco topics in the College, talked to us about the things they do to be sustainable, including the awards they have received so far. For example they too have meat free Monday and they do not heat their dining room because it would get colder quicker due to the size of the room. This would not be a good use of energy and therefore a waste of resources. The college has been awarded the silver award for ‘Switch Off’, which aims to address energy efficiency and sustainability in different ways. After learning about how they recycle using different bins and the small changes they are making to improve and address this topic, we had a little more time to ask some questions. As a moment they gave us coasters from the Switch Off project. I think this is a good way to remind us all to do our part too. Pollock members left Gonville and Caius armed with ideas to implement and enjoyed their walk back to school, passing other fellow House members on their way out. When we got back to school we created a collage of our findings and reflected on the answers we had gathered. 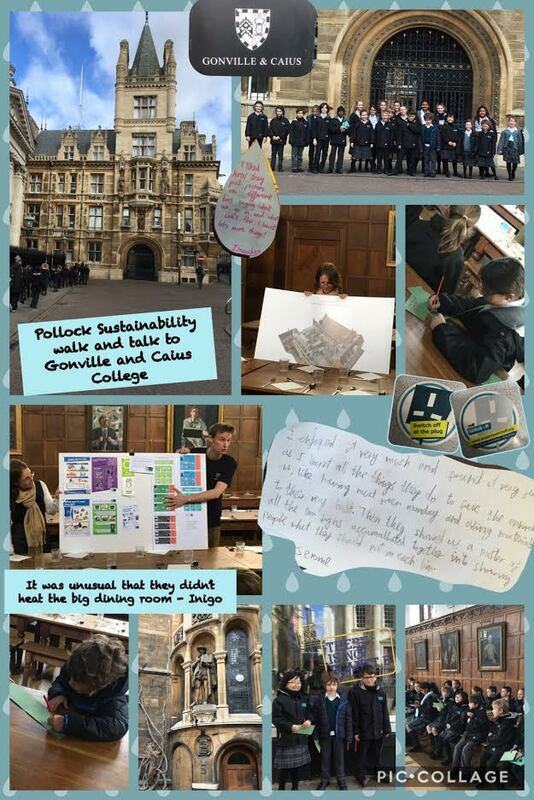 Pollock really enjoyed visiting Gonville and Caius and we learned lot of new ways to be sustainable. It was a good experience and a life lesson for our future. We are grateful for the time Jennifer and her student spent talking to us about this important topic. I enjoyed it very much and found it fun as I learnt all the things they do to save the environment, like having ‘meat free Monday’ and using materials to their very best. They showed us a poster of all the bin signs accumulated together to show people what they should put in each bin. This has helped recycling and made a difference to the waste we now have. Do College staff like helping with the project? Yes, they do because they feel that they can do well and they want to play a part in making a difference. I found the talk very interesting. I loved listening to how they do the student Switch Off, a bit like what we did during Switch Off fortnight. Do you think the College has helped the environment since the challenge started? Yes, totally, we will make a difference! Every little change can make that difference. It’s raised more awareness. Does the College have plants to encourage insects, butterflies and bees? Yes, there are trees and plants in our garden which encourage wildlife to visit our gardens. Are there different bins around the College to recycle different items? There are green, blue and black bins, and paper bins too. These are becoming more clearly signed so more people in College can learn about recycling. Do you know if the catering team has considered offering vegan or vegetarian meals? Yes, the default option is vegetarian so people have to make a special request for meat. The College also has meat free Mondays. In the future we are going to make the vegetarian option the main menu and those choosing to eat meat have to opt for this. So a switch around to encourage less meat meals and more awareness. Does the College use non-plastic items? Yes, we use items made of material such as glass and only replace these when they are broken. Does the College try to reduce the amount of paper used and, if so, how? They have reduced their use of paper by 50% and suggested that you put the printer further away from the computer to make this easier! Is the College involved in the Cambridge Green Challenge? No, because they have another challenge called student Switch Off instead. Does the College have reusable cups and cutlery? Yes, they re-use their cutlery, plates and cups. Even if they start to wear or loose their emblem, we only replace them when they really become unusable. I liked this visit because we learned a lot of things, like they have set up their own challenge called ‘Turn Off’. They are always looking for new ways to be sustainable. This gave me ideas too. I thoroughly enjoyed the eco-awareness walk and talk. It was a huge privilege being allowed in the College Hall. I really loved everything about it. ‘It’s Our World’ turned into ‘It’s Our City’ on Wednesday as we set off on foot at a brisk pace through the streets of Cambridge to Sidney Sussex College, the youngest of the oldest colleges. Walking through the dark wooden door off the busy Sussex Street and into the beautiful courtyard, was a bit of a Narnia moment for Rose House members. Katherine and Mel, the student Green officers of the College and our hosts for the visit, welcomed us warmly to the College and led us under archways and around the historic buildings avoiding the grass quadrangles, of course, over to the greenhouse. We were impressed by the seedlings, cuttings and plants here, which were carefully cultivated by the gardeners to be planted out into the flowerbeds at different times of the year, avoiding having to buy in lots of plants that would have to be transported from further afield. We spotted bird boxes and loved this haven for nature in the middle of a city, particularly the secret garden at the back of the College. Built in 1596 and designed for candlelight and fires, the College faces various challenges around making old buildings more energy efficient and sustainable. Katherine and Mel were keen to have ideas from Rose House members on what the Sidney Sussex could do to tackle this issue. There were suggestions about wind turbines, solar panels and double glazing, not to mention cutting back on electricity by making sure lights and appliances are switched off when not in use. We were interested to hear about the College switching to renewable energy providers. For our final part of the visit, we were invited into the Common Room to talk about some other initiatives that are taking place in the College. Many simple changes have been made by catering staff within the College to try to cut down on packaging, such as reductions in prices when students bring their own Tupperware or cups to take out meals or drinks. Also there has been more of a focus on thinking about alternatives to meat and encouraging vegetarian options on menus. Katherine and Mel explained about an insect tasting event that they had run recently in College and then we were all able to try some barbecue flavour meal worms and some buffalo worms. Rose House members proved themselves to be completely up for the challenge of trying something new and rather different and the barbecue meal worms were quite a hit! We certainly had a lot to think about on our walk back to school and really enjoyed our visit. On 13 March Street House members went on a walk to St Catharine’s College for our ‘Walk & Talk’ part of the ‘It’s Our World’ Project. Chloe, who is a second year student, was our guide and told us about how they make the College eco-friendly. We took a number of questions, prepared in a house meeting earlier in the week, which Chloe was able to answer. This is how St Catharine’s help to recycle: they have three types of bins in the coffee bar - one is for general waste, another is for recycling and the third is a compost bin. Special types of cutlery and cups that are biodegradable and compostable are used. They have many non-vegan snacks in the bar, non-dairy milk is provided and special tea bags that don’t contain plastic. As much food as possible is sourced locally so the environmental impact caused by shipping from other countries is minimised. Unfortunately they are unable to have many solar panels because most of the buildings are old and listed by the council. Bird feeders can be seen hanging from many of the trees to encourage wildlife. Batteries used to be recycled but they aren’t any more. A member of the eco-committee is selected to plan all the eco-friendly action. The College does have energy saving light bulbs and are installing motion sensing lights which switch off when rooms and corridors are empty. They have some accommodation in Grantchester which means the University can provide more sustainable living because these homes are not under such strictly listed building rules and can have solar panels and other ‘green’ features. Students read their books online to save paper and trees. 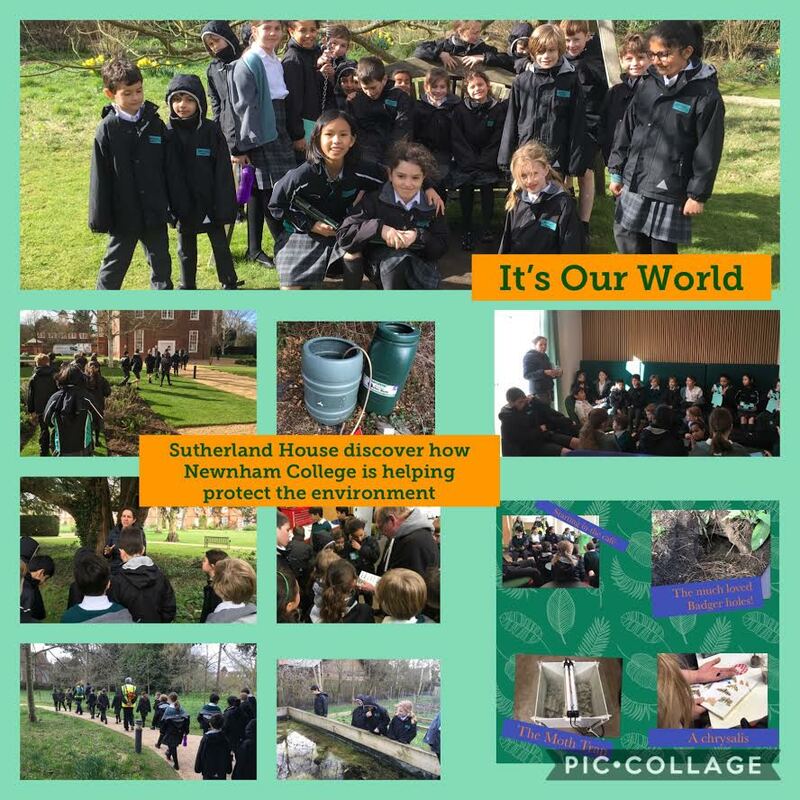 We really enjoyed our visit to St Catharine's and learnt a lot about how they are working towards a more sustainable environment; much of what they do are little things but these all add up to make a big difference! A Year 5 Street pupil said, ‘It was fun and enjoyable and I enjoyed going to the coffee bar’. A Year 4 pupil added, ‘I enjoyed looking at the old and new buildings’. Leaving promptly at 9 o’clock, Sutherland House members embarked on a brisk and blustery walk to Newnham College. On arriving at Porters’ Lodge on Sidgwick Avenue, they were kindly greeted by the porter and then Lottie, who is the Head Gardener of Newnham College and a former pupil of our school. We started in the café where Lottie explained that the College was trying to discourage the use of single use plastic by selling reusable cups and encouraging students and staff to refill their own cups. She kindly led us around the gardens and lawns, showing us the beautiful habitats of all the different creatures that live there. The College is trying to promote as much biodiversity as possible and we saw badger setts, bat and bird boxes and bee hives. We spoke to a moth expert named Chris, who records the different types and quantities of moths in Newnham College - there are hundreds of different species living in the gardens! Lottie also showed us the allotments that are available for all staff and students to grow their own food and all food waste from the College is composted. We were interested to find out how the College conserves water, especially considering the extent of the gardens. We learned that they deliberately choose plants, such as lavender, that are drought tolerant and they collect water in water butts for watering the gardens. As part of their new building work, they have installed solar panels which they hope will generate electricity. We all loved our visit. Lottie was very helpful and welcoming and answered all our questions very patiently! We would like to visit again - next time we would love to have a look around the inside of the College because it would be fun to see if the inside is as beautiful as the outside.